My friend Claire came out to see me in December and we decided to do a cooking class together. Despite living here for nearly 10 months I was yet to participate in one. We chose the Casa Luna Cooking school which is fairly famous as it is connected to Casa Luna Restaurant, Indus Restaurant and the Honeymoon Guesthouse (which I think used to be the Honeymoon Bakery). All are owned by the author Janet DeNeefe who has been living here since the 80s. I have read one of her books and I was intrigued to learn more about the beautiful dishes she described so eloquently! Our tour fell on a Tuesday which meant it included an early morning market tour. I have been the market many times, however (unlike my husband and kids) I never tire of going! I love the bright colours, the hype of all the activity and the odd assortment of ‘stuff’ that you find tucked around hidden corners! They really are a wonderful representation of all the colour, art and vibrancy that is found in life up here! The front of the markets are for tourists and have lots of fare that is often found at the back for a cheaper price and with more variety. Down at the bottom and towards the back is where the locals shop for their daily meals and whatever other bits and pieces they need. I believe it opens around 4am (yet to experience) and it peaks at 6am, however our general concesus was that 8am was early enough for us! 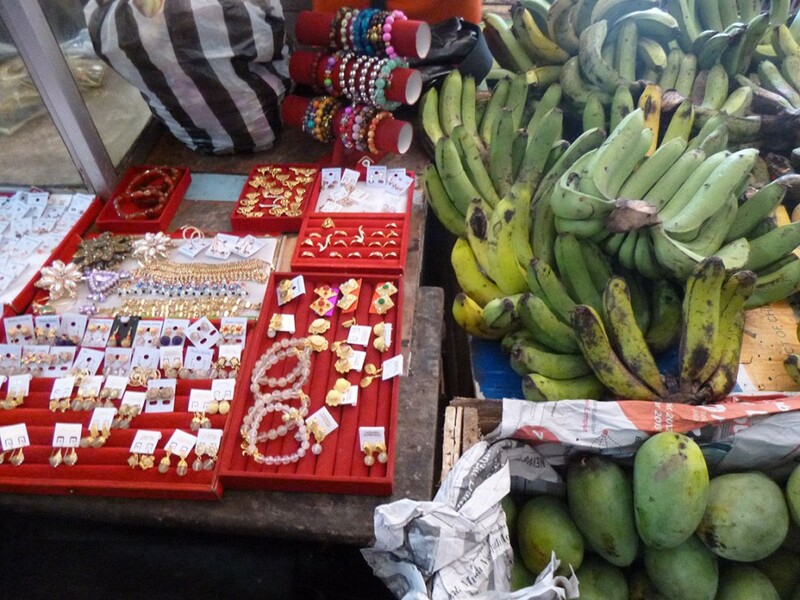 Products range from fresh local fruit and vegetables to spices to meat and fish to artworks, clothing, kitchenware, quilts, beads, jewellery and general bric-brac. There are lots of local ‘creations’ of art. 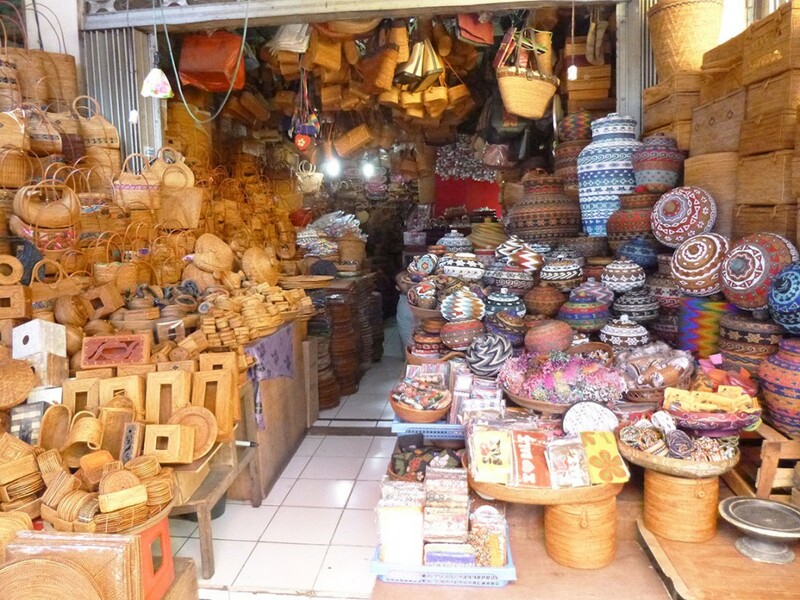 Ubud is a very artistic and cultural town and this is highly reflected through the market! 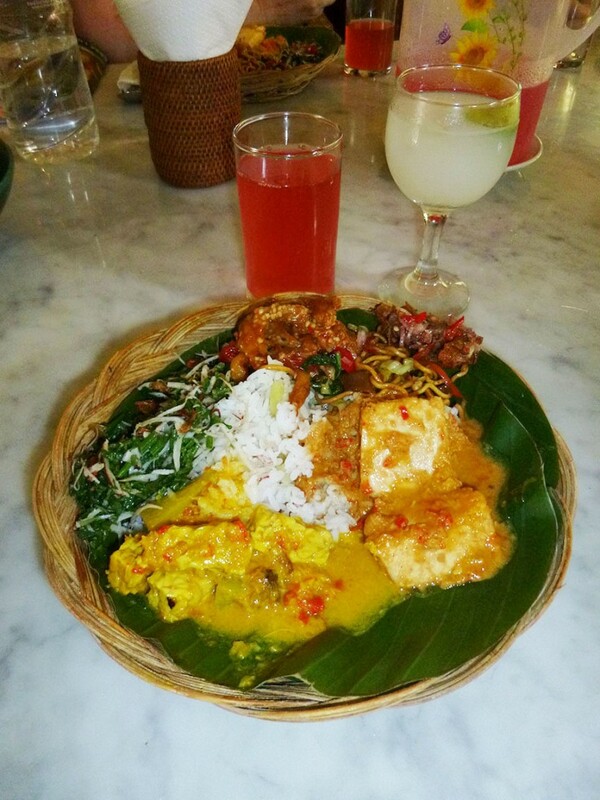 It is located on the corner of Jalan Raya Ubud and Monkey Forrest Rd (opposite the palace) and a great place to find lots of different things at very low prices. For example, I have seen cane goods sold there for maybe around $3-4 sold in high street shops for up to 10 times the price! The ability to barter is essential and is often treated as a game or a way to make conversation. It can be exhausting, but once you get used to it, it becomes the norm! I can thoroughly recommend have a look whenever you are in town! 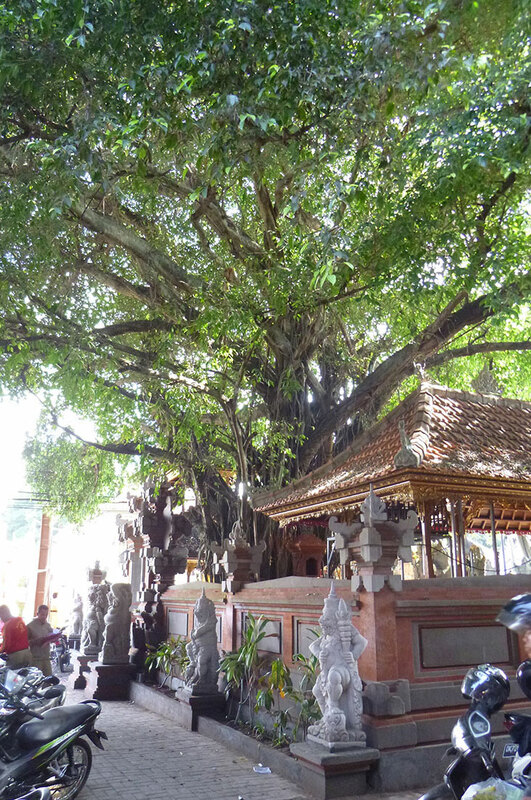 The beautiful Banyan tree outside the markets. I pass this tree almost daily and I just love the sheer size and grand nature of it! Cantik! 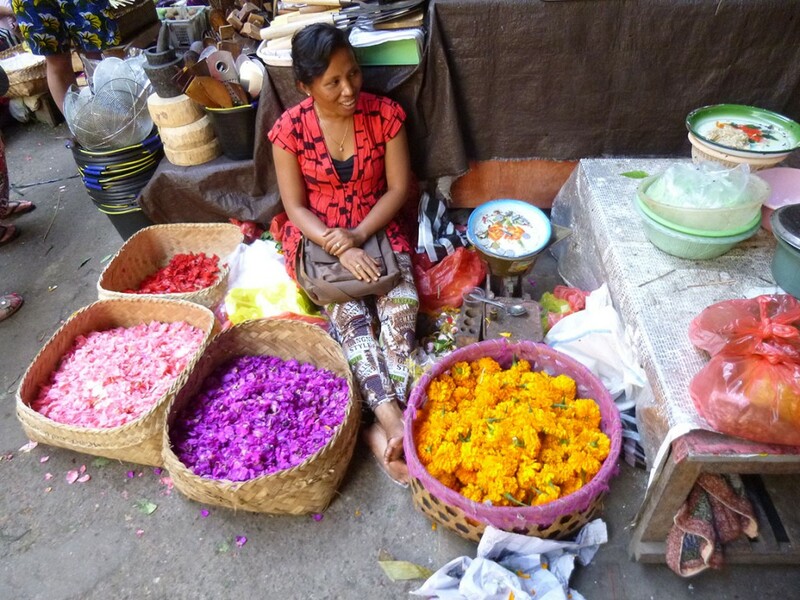 Beautiful flowers being sold for offerings or ceremony. 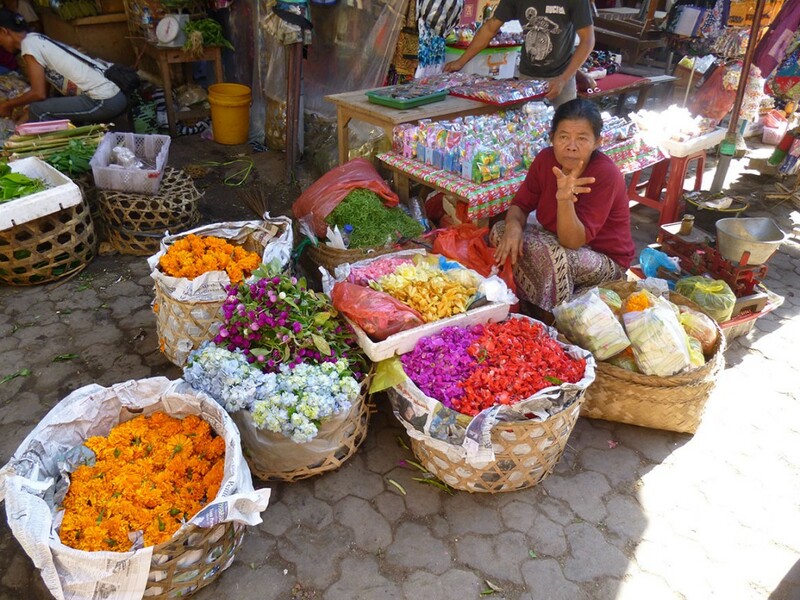 Each day these ladies sell flowers in the market. A small bag (think sandwich bag size) might cost around 20cents AUD. 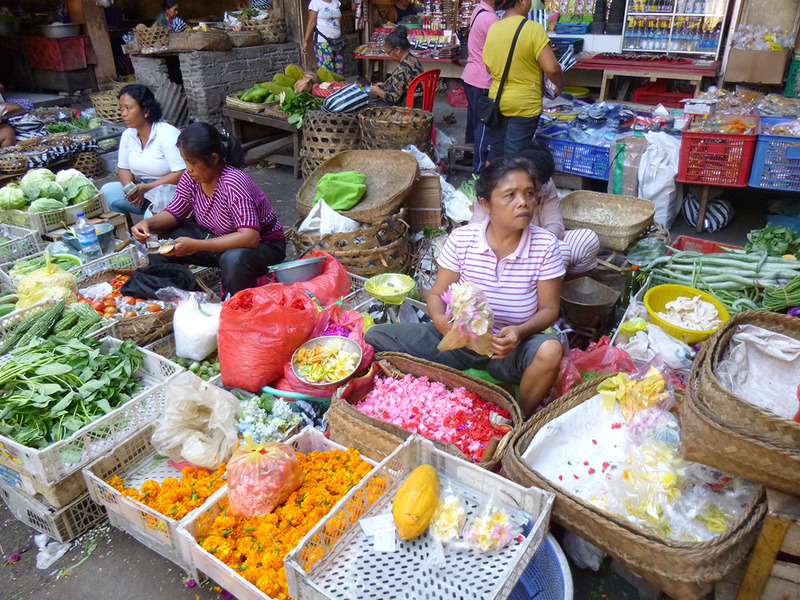 Local ladies selling their vegetables and flowers in the heart of the market. Beautiful Flowers available for offering in the entrance. Rattan, cane and beaded wears are very popular up here! I have bought quite a few cane baskets for the kids toys, placemats, tubs etc. The are all super cheap, are hard wearing and look great! 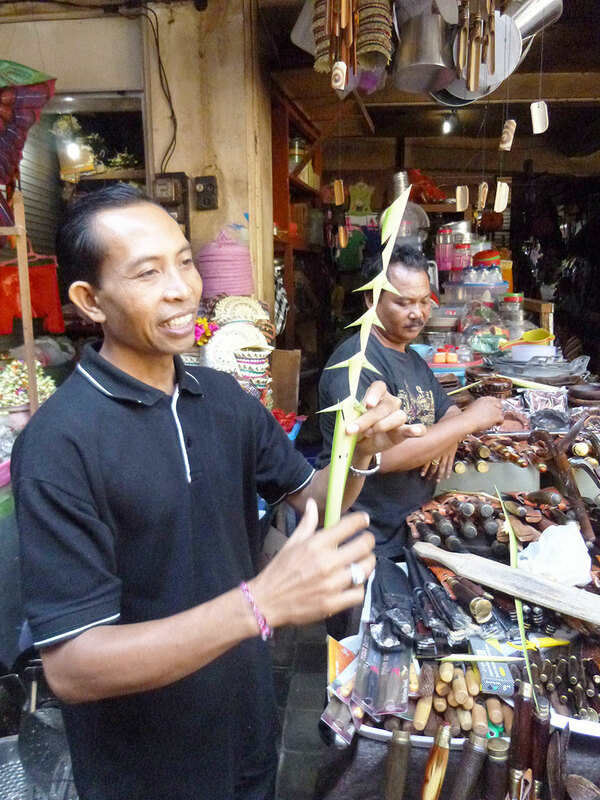 Our Market tour guide (Wayan) showing us how to make ceremonial decorations in the middle of the market. It took him about 2 minutes to create. They are used for temple ceremonies and as decoration all over Ubud. 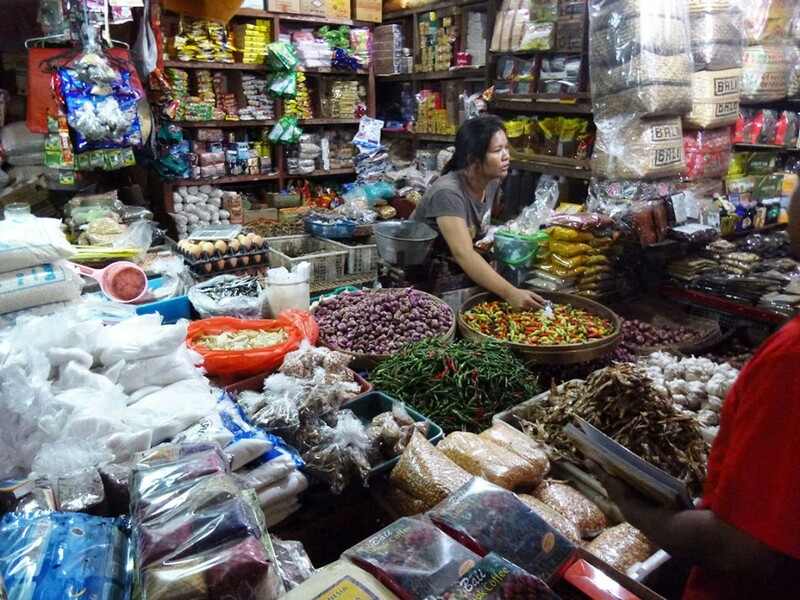 Spice Market – There are quite a few little shops that sell both fresh and dried spices amongst other things! Who needs jewellery and bananas? At the same time! I love the odd combinations of ‘stuff’ they have in the local market. 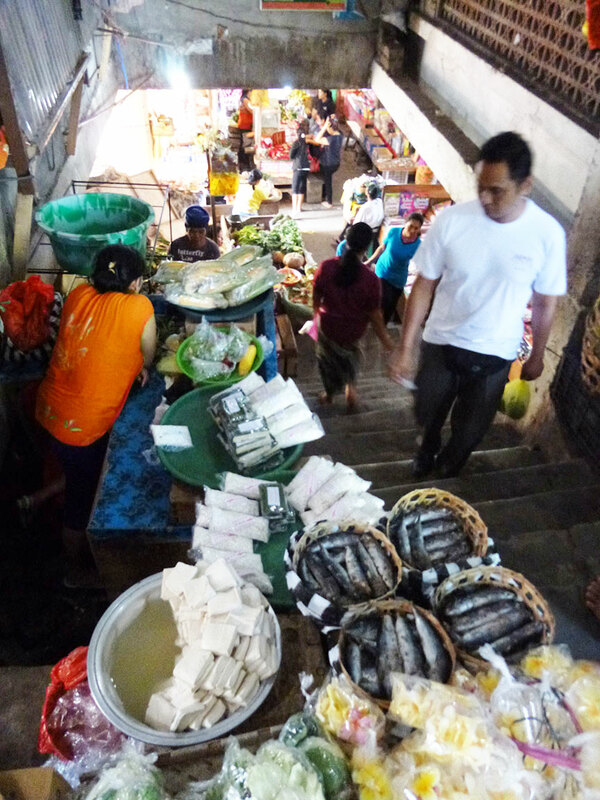 You can also buy fresh fish and tofu in the markets, although the word ‘fresh’ might be a slight exaggeration! 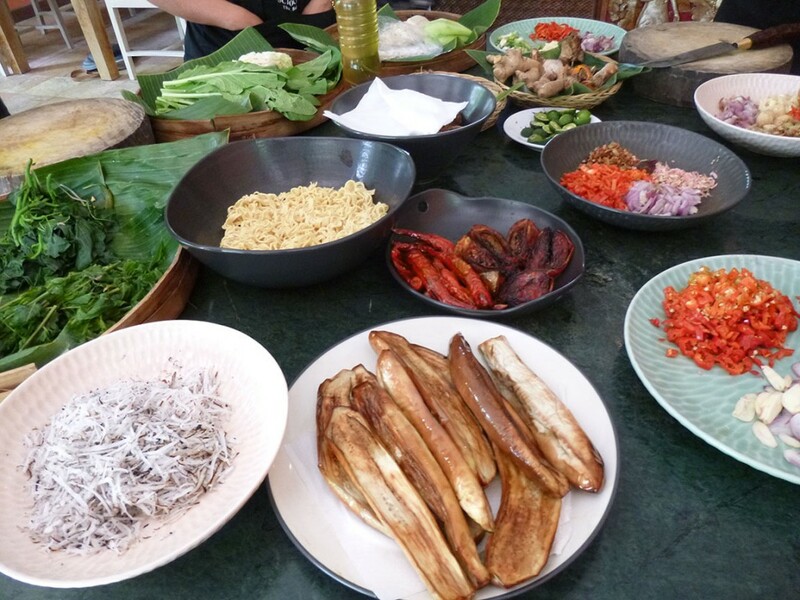 After we had finished our market tour we walked over the the Honeymoon Guest house, met Yude (our host and teacher) and were offered beautiful Hibiscus tea and palm sugar pancakes (because everyone needs a snack before they start a cook class!). Yude explained to us about where all the spices came from and how we were going to use them. 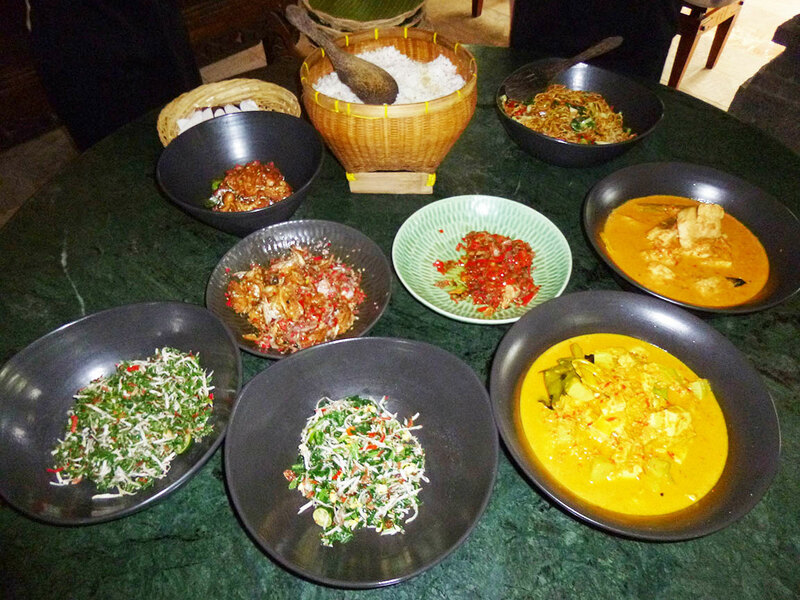 I think we had about 7 different dishes to prepare. The ingredients all looked so pretty and colourful! The preparation took ages but the cooking was fast! 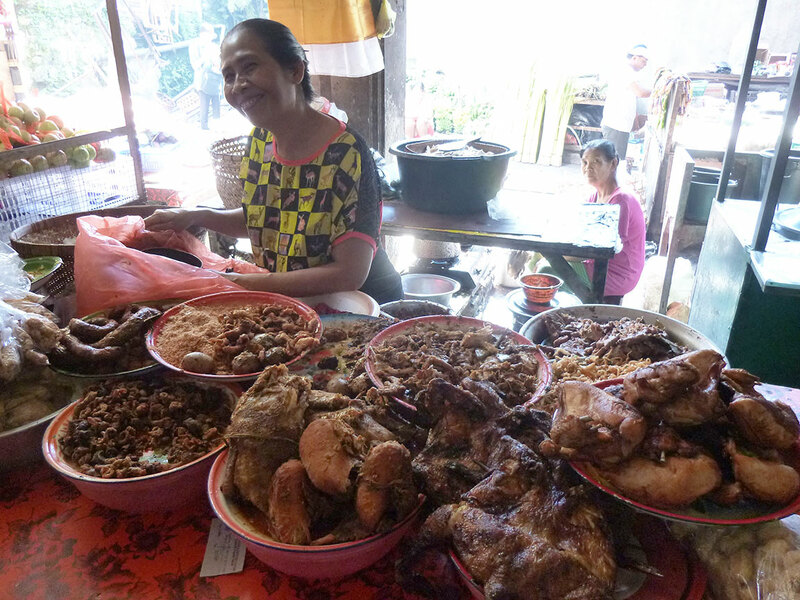 Balinese women can spend a great deal of their time preparing meals for their family or ceremony. There is no such thing as packaged food, nor are there many short cuts. Our teacher Yude (pronounced you-day) talking to us about all the different things we are going to make throughout the morning. 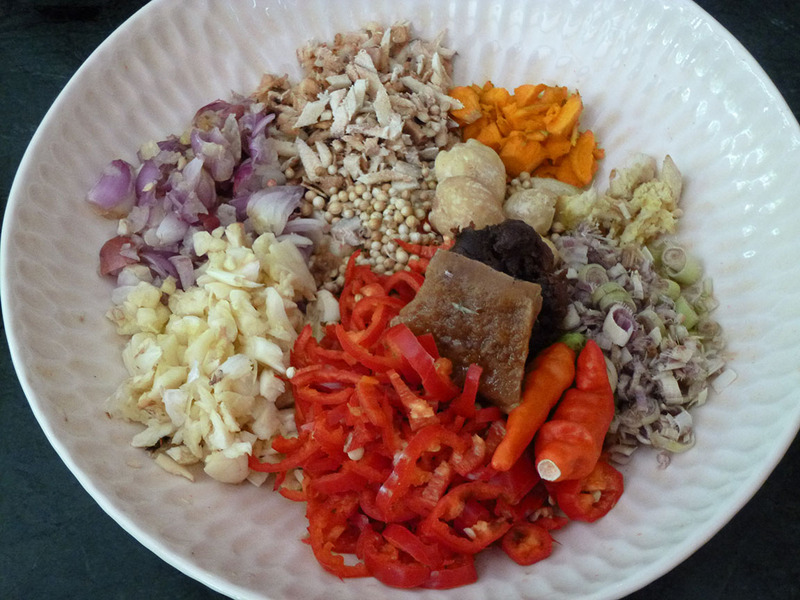 All the beautiful ingredients for one of our sambals. Everything we would need for our cooking class! It looks so bright and delicious! 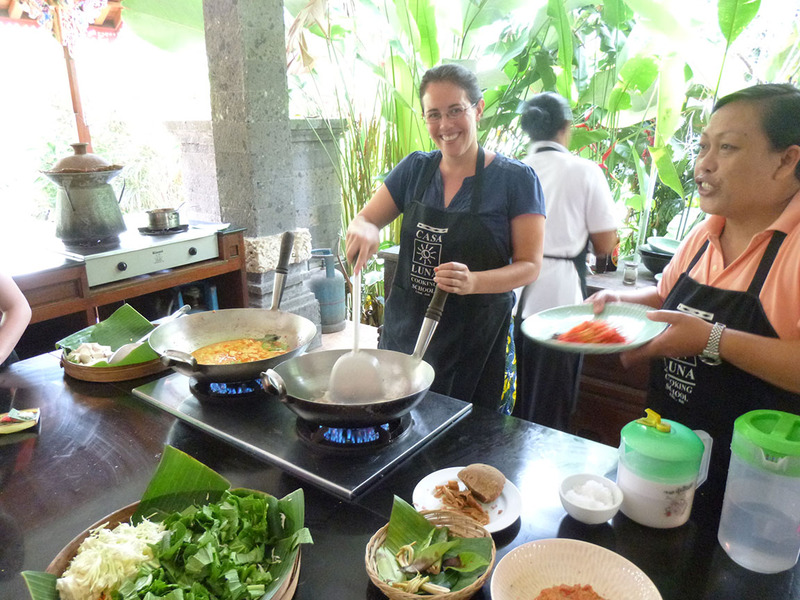 I love that most of our meals up here are cooked completely from scratch and there are very little additives or packaged products! 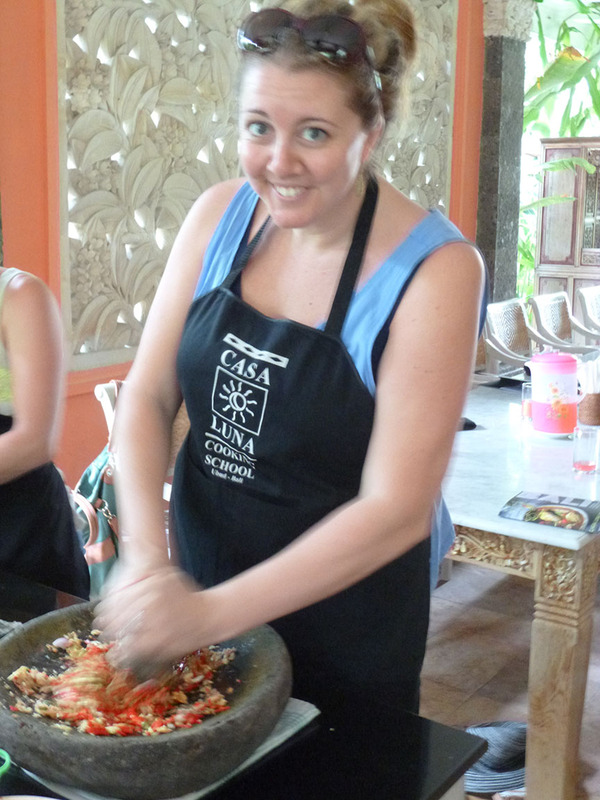 Claire making Sambal (spicy paste). 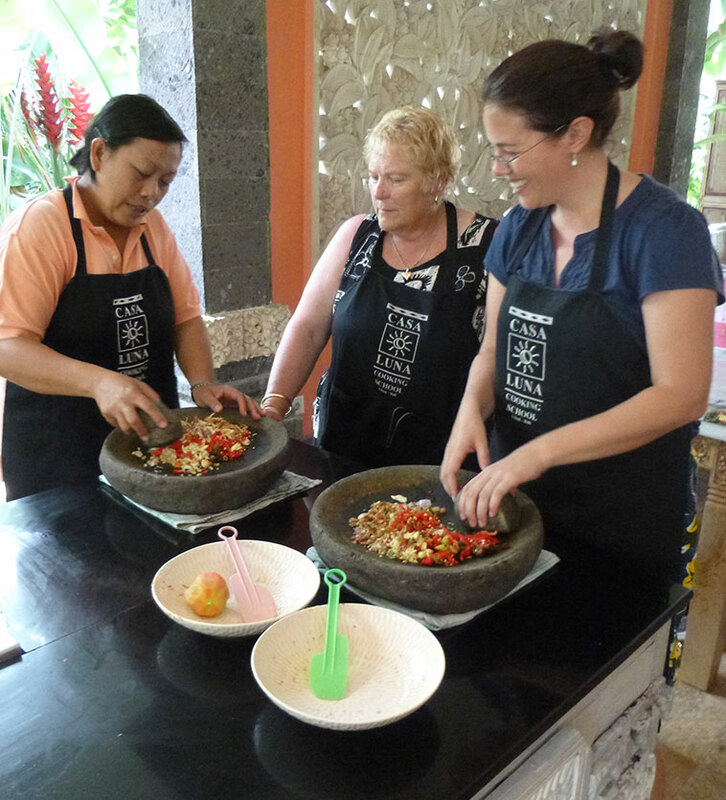 All the fresh ingredients go together and then you grind them in the large, flat mortar and pestle until it is a paste! The smell is incredible! 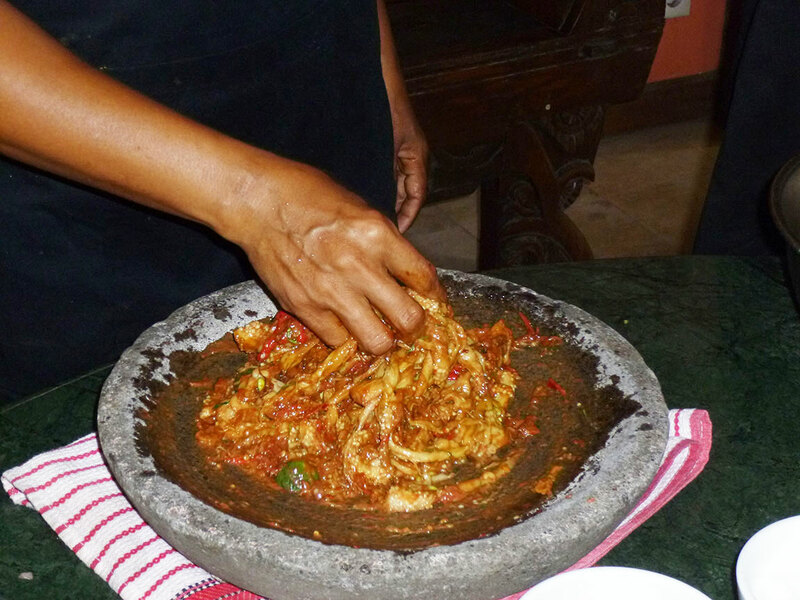 Grinding the sambal! Claire and I had a good go and thought we were making good progress and then Yude came along and turned it into a paste in about 30 seconds! Marinating the roasted eggplants! It was so good. One of my favourites! All of our yummy dishes we prepared including a fish curry, mee goreng, two different types of sambal, urap (fern salad) and roasted/marinated eggplants. The course was great. Well worth the effort. Even though I have been to the market many times before, it was still lovely to learn new things and see it from a different perspective! 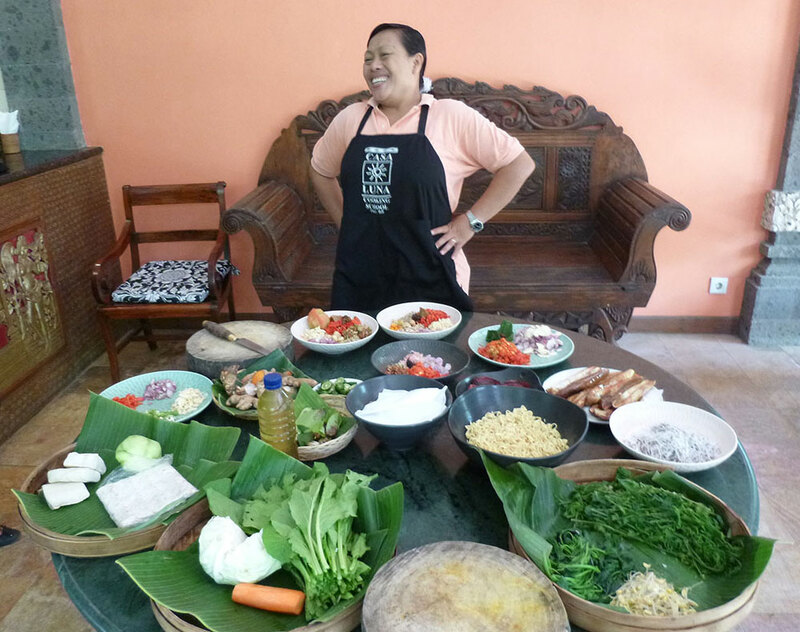 The cooking course is set in the Beautiful Honeymoon guest house and is spacious and very serene! I can highly recommend!